On October 22, GazaArk.org headlined "Release: Estelle crew beaten during (Israel's) attack. (Participants) were beaten during the attack and by interrogators." Former Canadian legislator "Jim Manly still in detention." Israeli policy includes repeated crimes of war and against humanity. Occupied Palestinians suffer most. Humanitarian activists are brutalized for trying to help. Participants in about a dozen missions were lawlessly interdicted in international waters. They were brutalized, imprisoned and deported. In May 2010, nine Mavi Marmara activists were murdered in cold blood. 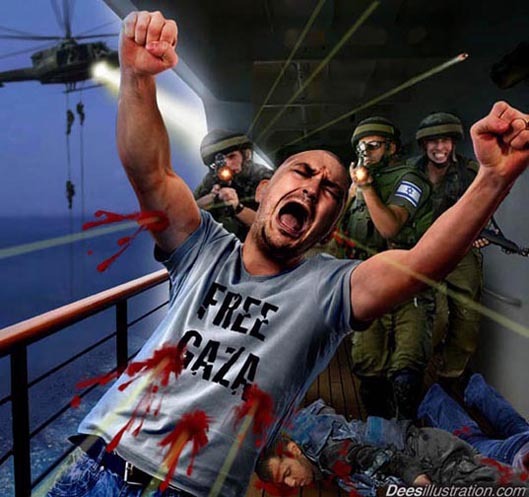 A previous article headlined "Brave Israeli Commandos Slaughter Aid Activists at Sea." Even media scoundrels couldn't duck a crime this grave, but don't think they didn't try. The UK-based Stop the War Coalition called it "Yet another act of Israeli barbarism." In response, an "emergency demonstration" was held near Prime Minister David Cameron's Downing Street residence. Thousands of Gazans protested. So did many supporters in Amman, Cairo, Damascus, Tehran, Ankara, Istanbul, Beirut, and other regional cities. Israel's propaganda machine went into overdrive. Millions knew what happened and expressed outrage. In September 2010, the Human Rights Commission (HRC) issued damning findings. 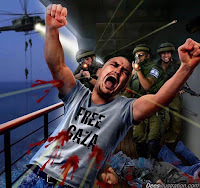 They "concluded that a series of violations of international law, including international humanitarian and human rights law, were committed by the Israeli forces during the interception of the flotilla and during the detention of passengers in Israel prior to deportation." Israel acted lawlessly "since there was no legal basis for the Israeli forces to conduct an assault and interception in international waters." belligerent measures taken by a nation (to) prevent passage of vessels or aircraft to and from another country. Customary international law recognizes blockades as an act of war because of the belligerent use of force even against third party nations in enforcing the blockade. Blockades as acts of war have been recognized as such in the Declaration of Paris of 1856 and the Declaration of London of 1909 that delineate the international rules of warfare." America approved these declarations. They're binding US law. They're also "part of the general international law and customary international law." Past US presidents Dwight Eisenhower and Jack Kennedy called blockades acts of war. Do did the US Supreme Court. Palestine poses no threat. Blockading Gaza has no legitimacy. Even Israel admits it. McClatchy obtained an Israeli government document that describes the blockade not as a security measure but as 'economic warfare' against the Islamist group Hamas, which rules the Palestinian territory. Nations may indeed decide whether or not to have economic or any relations with other states. It may not interfere in the lawful right of nations (including Palestine) to engage politically, economically or other legal ways with countries it chooses. Blockading Gaza is illegal. Doing so is an act of war. It's also a crime against humanity. So is brutality in any form as well as high-seas piracy. Lawyers in Turkey have filed a complaint with the Istanbul Public Prosecutor against Israeli leaders for seizing the Estelle with Nordic parliamentarian, activists and other civilians on board in international waters. Named were "Israeli President Shimon Peres, Prime Minister Benjamin Netanyahu, Defense Minister Ehud Barak, Foreign Minister Avigdor Lieberman, Israeli army Chief of Staff Benny Gantz and head of the Navy Ram Rothenberg." They're accused of "arbitrary arrest, confiscating maritime or railway transportation vehicles, intentionally causing damage to property, preventing communication (and) possible crimes against humanity." On the 20th of October, at approximately around 10:15 (CET) hours, Israeli Naval Forces boarded Estelle, took it over and routed it to Port Ashdod. At this moment, the vessel was approximately 30 nautical miles from the nearest shore. According to Article 3 of the 1982 United Nations Law of the Sea Convention, the territorial waters of a State are maximum 12 nautical miles. This means Estelle was sailing in international waters. In international waters all states enjoy freedom of navigation and the flag state regime applies. No State may exercise any kind of jurisdiction over foreign vessels as long as there is no suspicion of slave trading, weapons or drug smuggling, piracy or unauthorized broadcasting. Since none of these exceptions existed, Israel had no right to stop and seize Estelle. Imposing a naval blockade is only possible in an International Armed Conflict which requires at least two conflicting States. Since Israel does not recognize the State of Palestine, the conditions for an International Armed Conflict are not fulfilled. Therefore, there is also no legal ground to impose a naval blockade on the Gaza Strip. Israeli crimes violate fundamental international law. The well-established universal jurisdiction principle (UJ) applies. It holds that certain crimes are too grave to ignore. They include genocide, crimes of war and against humanity. Under UJ, nations may investigate and prosecute foreign nationals when their country of residence or origin won't, can't, or hasn't for any reason. Israel used it to convict and execute Adolph Eichmann. A US court sentenced Chuckie Taylor, son of former Liberian president Charles Taylor, to 97 years in prison for torture. The Hague convicted and sentenced his father to 50 years imprisonment for war crimes and other offenses. Though never held accountable for murdering Chileans and other human rights abuses, Britain used a Spanish court provisional warrant to apprehend Augusto Pinochet. He was held under house arrest for 18 months. It set a precedent. It let other heads of state and top officials know they're vulnerable. The official position of defendants, whether as Head of State or responsible officials in Government departments, shall not be considered as freeing them from responsibility or mitigating punishment. No one deserves immunity for high crimes demanding accountability. It's long past time guilty US and Israeli officials faced justice. Those most culpable are considered hostis humani generis - enemies of mankind. War crimes are against the jus gentium - the law of nations. International law was established to address them. The Nuremberg Charter, Tribunal and Principles determined that crimes of war and against humanity are "international crimes" too grave to ignore. Tribunal Principles hold that "(a)ny person who commits an act which constitutes a crime under international law is responsible therefor and liable to punishment...."
"(C)rimes against international law are committed by men, not by abstract entities, and only by punishing individuals who commit (them) can the provisions of international law be enforced." The Rome Statute's Article 25 of the International Criminal Court codified the principle. It affirmed that persons culpable of crimes and war and against humanity be prosecuted. Nuremberg established that immunity is null and void. Top officials, including heads of state, should be held accountable. Western and Israeli ones so far escaped judgment even though fundamental international law affirms no one is above the law. I am now on my way home, but I keep thinking of my shipmates, my fellow activists from abroad who are still imprisoned under harsh conditions and undergo interrogation by the Shabak Security Service, among them Parliament Members from several countries. Israeli Elik Elhanan was on board Estelle. "Today," he said, "the court ordered his release and that of two other detained Israelis, Yonatan Shapira and Reut Mor." At first they tried to charge us with all kinds of very serious felonies, such as 'aiding the enemy'. The court rejected this out of hand. Today they tried an article on the law books called 'Attempted infiltration into a part of the Land of Israel which is not part of the State of Israel (sic).' But the court threw out this charge, too. Jim Manly, former Canadian MP (1980-88) and retired United Church Minister, continues to be detained in Israel with many of the other crew members of the Estelle, without any news about when (they'll) be released. This despite freeing the Greek, Italian and Spanish citizens who were on the Estelle and the release of Israeli activists after being detained and charged. Those still held refused to sign confessions saying they entered Israel illegally. They were kidnapped and forcibly brought to Ashdod. Other foreign nationals released signed and were deported. Elhanan and others said Israel used excessive force. Taser "electro-torture" was used. Israeli Yonatan Shapira said they were tasered repeatedly on their arms and legs. It was "horrible," he explained. Elhanan's father said he saw burn marks on his son's hands. He and others were brutalized. A Greek MP on board "was beaten by Shabak Security Service interrogators." Elhanan accused Israel of using "completely disproportional force against us." When the Navy arrived to take us over, Yonatan Shapira counted no less than fifteen vessels surrounding us on all sides. Large and small ships and boats, a ship carrying a helicopter, as well as the Zodiacs of the Naval Commandos. Fifteen armed naval vessels against one small civilian boat carrying games for the children of Gaza. We must have disturbed very much the Navy and those who give orders to the Navy. These testimonies increase our concern for Jim and continue to raise the question why aren’t the Canadian government and the opposition NDP doing more to secure his release? Yonatan Shapira, Elazar Elhanan, and Reut Mor were released on 50,000 NIS (New Israeli shekels). About four shekels equals one dollar. Beersheba District Court Judge Yael Raz-Levi ordered their release and banned them from approaching within 500 meters of Gaza. "Her order superseded the Ashkelon Magistrate’s Court ruling Sunday." It remanded Estelle activists to police custody for 72 hours. It left open possibly holding them longer. Judge Raz-Levi said releasing the three Israelis wouldn't obstruct investigative procedures. Israeli prosecutors admitted the same thing. Police argued that releasing the men endangered public order. They said anyone participating in Gaza missions try to breach Israel's blockade. Contrary to documents Gisha obtained and McClatchy Newspapers reported, they claimed besieging Gaza is essential to Israel's security. Of course, it has nothing whatever to do with it. Most important is that it violates fundamental international law. Raz-Levi dismissed police arguments. Elhanan didn't regret sailing on Estelle. He "knew what (he) was getting into." He and others were well briefed and trained for their mission. 'Elhanan, you will pay for your leftism.' They proved it by tasering him repeatedly. He's not dissuaded. He said 'if they think they could deter me, and those who sailed with me, they are mistaken ... The siege of Gaza is an ongoing crime, and it must be ended. We will continue the struggle. Other global activists feel the same way.